Many faculty on campus have been asking for a simple way for 1) students to archive major assignments and projects and 2) entire classes to share reflections or other posts to a central class blog. The new Portfolio Blog system attempts to solve these two challenges. Your portfolio blog represents personal development as a process rather than a single product, and allows your teachers, peers, and family or future employers a glimpse at how your thinking has been shaped across multiple semesters. STEP 1: First, if you haven’t already, you’ll need to locate your portfolio blog. You’ll find it by adding your MyACU username to the main blog address: http://blogs.acu.edu/abc12d , for example. STEP 2: To edit blog posts or customize the layout of your blog, you’ll also need to find your portfolio Dashboard. Just add “wp-admin” to the end of your portfolio address: http://blogs.acu.edu/abc12d/wp-admin , for example. 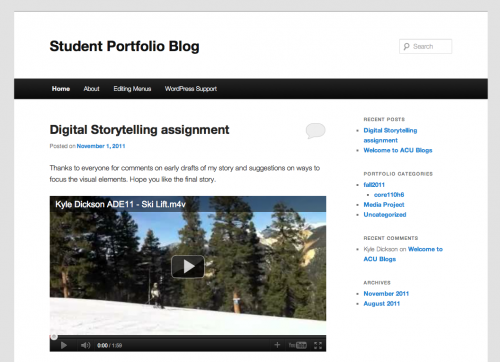 STEP 3: Watch the introductory videos below to learn more about publishing content and customizing your portfolio blog. As part of our first semester supporting portfolio blogs, the Learning Studio developed the following short videos introducing key concepts in managing your first blog. For more specific questions like adding images to a blog post or widgets to your sidebar, see the WordPress Screencasts page or come by the Learning Studio during afternoon staff hours.